Designed and built in America. Patent Pending. The Hatboro-Horsham School District in Montgomery County, Pennsylvania, enjoys a strong tax base, the support of parents and the communities it serves, and recognition from both the Pennsylvania Department of Education and the United States Department of Education for excellence in education. Yet even Hatboro-Horsham faces difficult choices at budget time and has turned to fund raising, the province of private schools, to help meet some of its needs. For teachers like Jeanette Pomeroy, Stacy Lewandowski and Maria Kerr, and occupational therapist Kate Muro, AlertSeats™ are on a the wish list that private donations are being sought to fill. The Hatboro-Horsham School District ordered AlertSeats with optional lockable wheel dollies for mobility. The sizes, in this case small/medium, matches the child, unlike-one-size-fits all conventional classroom chairs. Hatboro-Horsham occupational therapist Kate Muro says the AlertSeats encourage attention and posture while allowing a child’s need for movement. Fidgeting and bouncing on an AlertSeat doesn’t disrupt the class. At Hatboro-Horsham, the AlertSeat covers are customized with school colors and the district logo. The zip-off covers are washable and the steel frame has a 300 pound capacity even in the smallest sizes. Observation has convinced Hatboro-Horsham special education teachers that AlertSeats encourage concentration and time on task. 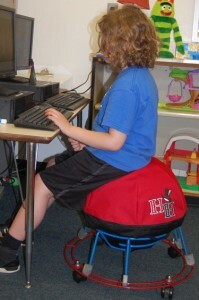 Because of the stand, they offer students needed sensory experience with more stability than ordinary exercise ball seats. 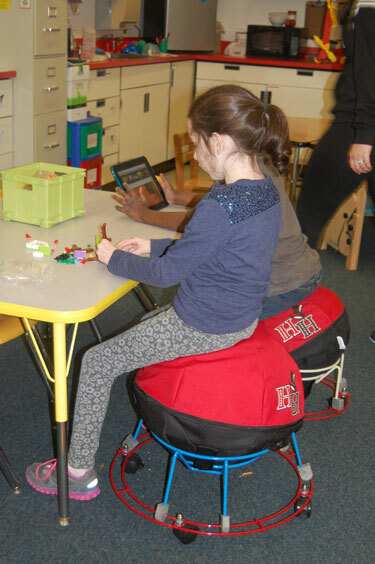 Pennypack Elementary School special education teacher Jeanette Pomeroy has seen the benefits of the AlertSeat™ in her learning support class where the seat helps one of her autistic students perform better. “In the AlertSeat™ he gets the mobility he needs, which allows him to focus,” she says. 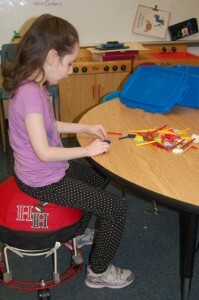 There is just one AlertSeat™ in her classroom. She would like more. Stacy Lewandowski, Jeanette’s colleague at Pennypack, has a student who was always getting up from his chair and wandering around the classroom. An AlertSeat™ gives him the movement he needs and has ended his disruptive habit. She would welcome more of the devices in her classroom. “Movement and cognition are closely related,” said Maria Kerr, a special education teacher at the Simmons Elementary School. For three students in her class of students with cognitive disabilities, AlertSeats™ allow comfort and movement. She thinks that many more students would benefit if the district could purchase more of them. 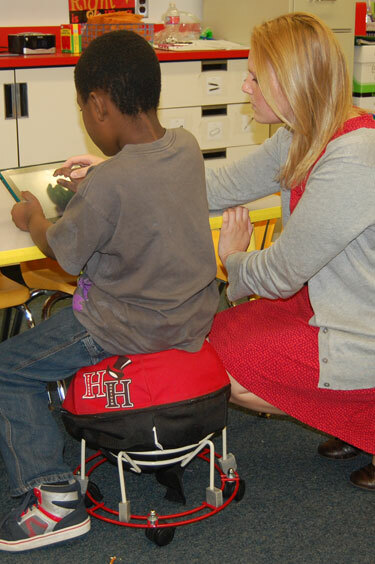 Kate Muro, an occupational therapist who works with students from kindergarten to twelfth grade, observation has provided all the proof she needs that AlertSeats™ benefit many children. “We’re all about data,” she said, having compared student performance on the devices and on regular school chairs to reach her conclusion. She has seen the results in students with a range of disabilities including attention deficit/hyperactivity disorder, cerebral palsy, autism, low muscle control and Down’s syndrome. Public funding is changing and school districts have no choice but to look to other sources for revenue. That task falls to Jeannie Hagan, Director of Outreach and Communications for the Hatboro-Horsham School District. She has focused on getting to know stakeholders, developing relationships with organizations and building community partnerships. The community has a very personal interest in the school district and she’ll be seeking funding support for growing programs that even this affluent district’s budget won’t cover. Right now, Jeannie Hagan is focused on providing the AlertSeats™ that Jeanette Pomeroy, Stacy Lewandowski, Maria Kerr, Kate Muro and others in the district would like to see in more widespread use. A campaign to do that will start soon. To learn how school districts like Hatboro-Horsham and others throughout the country are using the AlertSeat™ and AlertDesk™ in regular and special education classrooms, visit our website at www.alertseat.com and select Product Reviews and Articles. Engineered solutions to make people stronger, healthier and more productive.